On Sunday evening, I went to a Boston Food Bloggers meetup event in Inman Square. I was a bit nervous about it (I'm shy), and I was really tired after a weekend in New Hampshire with Andrew's company, but I'm really glad I went! It was a lot of fun, and I met some cool people. The meetup started up at Christina's Spice and Specialty Foods, which I haven't been to in a while. While I was there, I picked up some za'atar, a Middle Eastern spice blend that I have been curious about for a while. I believe the main ingredients are thyme, sumac, and sesame seeds. After tasting a bit - it's delicious! - I decided to use it to spice up some cauliflower that we had in the fridge. 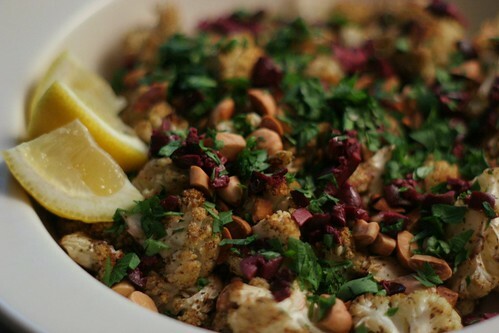 I tossed the cauliflower in oil and za'atar, roasted it, then sprinkled on some more za'atar to amp up the flavor, as well as lemon juice, chopped olives, toasted almonds, and parsley. The final dish was fantastic - cauliflower can be a bland and boring vegetable, but here it was packed with flavor. I can't wait to experiment more with za'atar, as well as with the harissa that I bought - let me know if you have any ideas! Set a rack in the middle of the oven and preheat to 400 deg F. Toss cauliflower florets with 1 1/2 tbs olive oil, 1 1/2 tbs za'atar, and a sprinkling of salt and pepper. Roast in preheated oven until browned and tender, turning once, about 40 minutes. Sprinkle roasted cauliflower with remaining 1/2 tsp za'atar, add a few good squeezes of lemon juice, and drizzle with good-quality olive oil. Add more salt and pepper to taste. 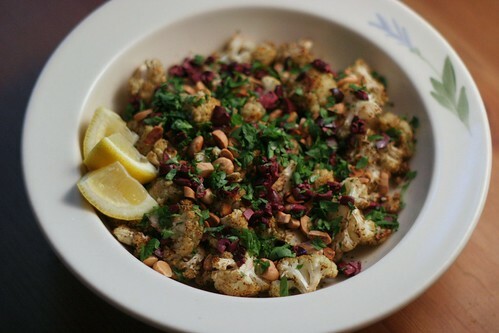 Sprinkle toasted almonds, olives, and parsley over the top of the cauliflower before serving. Serve with lemon wedges if desired. I've never tried za'atar, but it sounds delicious! I'll have to keep my eyes open for some. You could also try making za'atar, if the ingredients are easier to find. I've seen plenty of recipes on cooking websites!